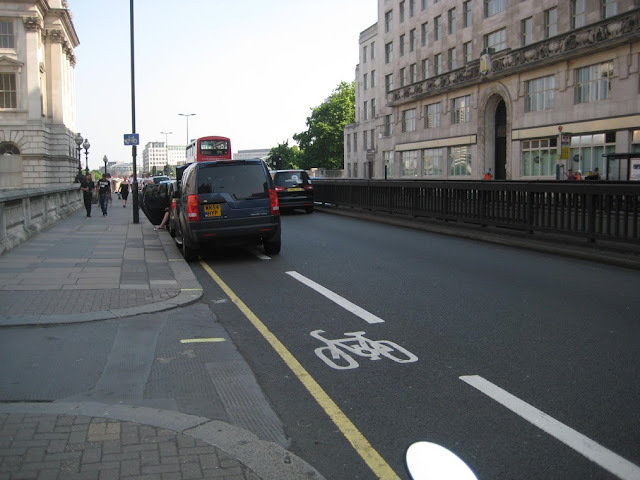 In all the excitement and controversy around Royal College Street, I forgot to mention the London Cycling Campaign's Space for Cycling protest ride outside Parliament tonight, Monday 2 September. Come if you can; meet 6:00pm for a 6:30 start, Jubilee Gardens on the South Bank. The House of Commons will be debating the Professor Phil Goodwin's Get Britain Cycling Report, the first time they have debated cycling in the chamber for a long time (decades). ....The Department for Transport was asked to take a lead - but they have refused to be pinned down. Instead of demonstrating the vital leadership on technical expertise and national policy-making that the All-Party Parliamentary Cycling Group requested, they have stuck to their failed ‘strategy’ of drip-fed, inconsistent funding, spread around with no overarching rationale. The car park (also the cycle lane) on Waterloo Bridge, exemplar of the contempt in which the safety of cyclists is held by the City of Westminster, the Department for Transport, and the government.